The Fuertes’s Parrot Bird Reserve was established in December 2007 in order to ensure the conservation of the Fuertes’s Parrot (Hapalopsittaca fuertesi) habitat and resident and migratory birds that frequent it. It is located on the western flank of the Cordillera Central of Colombia, in the village Pedregales Alto, Genova, Quindio, in the vicinity of the Municipal Reserve El Mirador. Its altitudinal range extends from the 2,900m up to 4,000m. It has an area of 1.619 acres between the fragile ecosystems of the Andean forest, high Andean plateaus and moorlands of the central cordillera of Colombia, in which live the Fuertes’s Parrot and the Golden-plumed Parakeet (Leptosittaca branickii). It is considered by the Alliance for Zero Extinction as an AZE site. (See map). 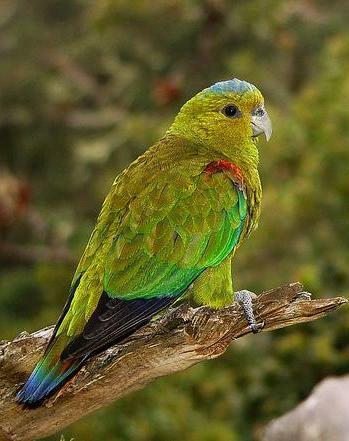 There are species of high conservation significance as the Fuertes’s Parrot (Hapalopsittaca fuertesi), an endemic and critically endangered species, the Golden-plumed Parakeet (Leptosittaca branickii), a species considered vulnerable, and Rufous-fronted Parakeet (Bolborhynchus ferrugineifrons) endemic species and endangered. Temperatures range between 6 and 15 ° C and it is an area that has a lot of cloud. It is situated between: Andean forest, between 2,400m and 3,000m, with an estimated rainfall between 900-1000mm; high Andean forest, between 3,000m and 3,200m, in which the annual amount of rainfall is 1,852mm; low moorland, between 3,200m and 3,500m, with a total annual rainfall of 1,716mm, and high moorland average between 3,501m and 4,100m presenting an annual amount of rainfall of 1,548mm. Project Central Cordillera, ecological easements, Women for conservation Restoration ecological y Artificial nest program. bird watching tour, identifying the local parrot species. Bring cold weather clothing, Pantanal boots, insect repellent, sunscreen and sun protective accessories. Report any health problems/or allergies. Follow the instructions of the reserve’s personnel and transit the established paths. 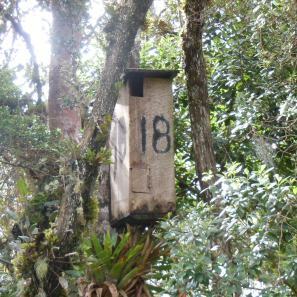 With the aim of increasing the supply of nesting sites for Fuertes’s Parrot (Hapalopsittaca fuertesi) conservation staff have established 20 artificial nest boxes in the Giles-Fuertesi Reserve, in the hope that the species will continue to increase their population size. ProAves has set up the new 368 acre Giles-Fuertesi Bird Reserve that protects a unique High Andean cloud Forest located on the eastern flank of the Central Cordillera in Cajamarca, Tolima Dept. The reserve protects one of only two known breeding populations of the Indigo-winged Parrot and critical for its survival. ProAves has purchased and saved 1,500 acre of montane forest for one of Colombia’s most endangeered species, the Fuertes’s Parrot, thanks to American Bird Conservancy and IUCN Netherlands/SPN and Netherlands Postcode Lottery.